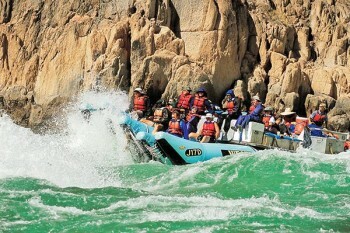 Colorado River Adventures, a trip of a lifetime!! What a great adventure! The guides, Lindsay, Jace, Micky and Joe were the best! Funny, fun, explained everything so well, great cooks, historians, storytellers and obviously very good at driving these rafts!! It was exciting, and could be scary, depending on where you sat on the raft. But there is always a quieter choice in the 'chicken coop', if you are less adventuresome. 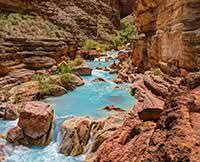 So good for all .... Lots of hiking, swimming in beautiful rivers and waterfalls, and a great variety of activities along the way down through the Colorado River!! The temperatures were extreme, from freezing water to hot, hot sun, and a person can go from soaking wet one moment, to almost too warm, the next. The people we met on the trip were wonderful, and I look forward to seeing some photos as we did not bring a camera!! The trip is extraordinary, and as I said...'A trip of a lifetime'.